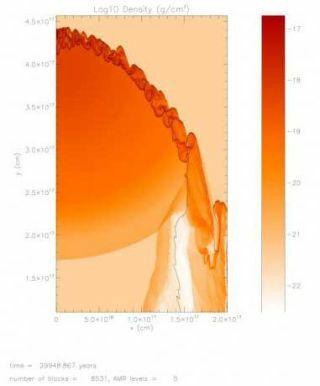 Cross-sectional view of one-half of a solar-mass target cloud being struck by a supernova shock front that is traveling downward. The colors represent the target cloud, with redder colors representing denser regions. The solid black contours delineate material that was originally in the supernova shock front, where short-lived radioisotopes are being injected into the collapsing target cloud. First there was the theoretical Big Bang that got the universe going. Several billion years passed. Then a Little Bang birthed our solar system. At least scientists have long thought that's how it went, and now they have a computer model to back up the idea that our sun is the product of an explosive event. The new modeling finds that a supernova, or exploding star, could indeed have triggered birth of our sun in a dense cloud of gas and dust, the researchers say. Stars are born when a cloud of material collapses. Exactly what triggers the collapse is not entirely known. One idea is that most stars, including perhaps our sun, were created in dense starbirth regions when another very massive star explodes, putting intense pressure on surrounding clouds. "We've had chemical evidence from meteorites that points to a supernova triggering our solar system's formation since the 1970s," said theorist Alan Boss of the Carnegie Institution. "But the devil has been in the details. Until this study, scientists have not been able to work out a self-consistent scenario, where collapse is triggered at the same time that newly created isotopes from the supernova are injected into the collapsing cloud." Short-lived radioactive isotopes -- versions of elements with the same number of protons, but a different number of neutrons -- found in very old meteorites decay on time scales of millions of years and turn into different (so-called daughter) elements. Finding the daughter elements in primitive meteorites implies that the parent short-lived radioisotopes must have been created only a million or so years before the meteorites themselves were formed. "One of these parent isotopes, iron-60, can be made in significant amounts only in the potent nuclear furnaces of massive or evolved stars," Boss today. "Iron-60 decays into nickel-60, and nickel-60 has been found in primitive meteorites. So we've known where and when the parent isotope was made, but not how it got here." Previous models by Boss and former DTM Fellow Prudence Foster showed that the isotopes could be deposited into a pre-solar cloud if a shock wave from a supernova explosion slowed to 6 to 25 miles per second and the wave and cloud had a constant temperature of -440 degrees Fahrenheit (10 K). "Those models didn't work if the material was heated by compression and cooled by radiation, and this conundrum has left serious doubts in the community about whether a supernova shock started these events over four billion years ago or not," said Harri Vanhala, who found the negative result in his Ph.D. thesis work at the Harvard-Smithsonian Center for Astrophysics in 1997. In several runs on the computer, the shock front was made to strike a pre-solar cloud of material with the mass of our sun, consisting of dust, water, carbon monoxide, and molecular hydrogen, reaching temperatures as high as 1,340°F (1000 K). In the absence of cooling, the cloud could not collapse. However, with a newly crafted theoretically plausible cooling law, the researchers found that after 100,000 years the pre-solar cloud was 1,000 times denser than before, and that heat from the shock front was rapidly lost, resulting in only a thin layer with temperatures close to 1,340 degrees F (1000 K). After 160,000 years, the cloud center had collapsed to become a million times denser, forming the protosun. The researchers found that isotopes from the shock front were mixed into the protosun in a manner consistent with their origin in a supernova. Other studies have suggested that our sun may have been born in a very crowded environment, near massive stars, but has since drifted to its relatively lonely position in space. The results are detailed in the Oct. 20 issue of the Astrophysical Journal. Boss has previously shown that all this violent activity might have contributed to the makeup of our planetary system, too.